The cold and flu season is quickly coming upon us and during this time, I often get asked, “How do we cope with a sick child and stick to manage their sleep?”. To be honest, the onset of a minor illness is frustrating, especially when you are finally seeing progress with sleep training. Your baby is just getting the hang of sleeping on their own and the whole family is experiencing longer periods of restful sleep and then Bam! Your little one gets sick with a cold or an ear infection, which has the potential to throw off all of your hard work. In general, I encourage families to start their sleep program when they have a couple of weeks to really devote to the plan, but you just can’t schedule around sickness. 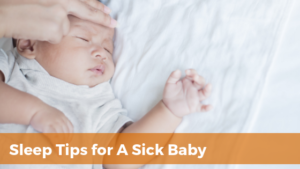 So, I have a few suggestions for you with regards to your baby’s sleep when they develop a cold. Hopefully, these tips can help you push through this time and keep you motivated in your sleep training plan. 1. Keep your Child in their Bed. I fully understand the desire to bring your child into your bed and be their comfort and security. Resist this temptation. If you feel the need to be in the same room, grab a mattress and lay it out on the floor. It won’t be as comfortable for you, but it is less disruptive for your little one. It keeps them in their familiar sleeping space and you don’t run the risk of him or her getting used to using your bed for comfort. In order to create sleepers that fall back asleep independently, we eliminate any items or actions that your child is dependent upon such as pacifiers, rocking or bottles. These props require you to either find the prop or perform the action in the middle of the night. They are often a source of comfort for your child and it is really hard not to offer it when they are feeling miserable. However, by reintroducing the prop, it creates confusion and it is actually harder to remove the second time around. Confused? I just offered tips that seem the opposite of comfort – keep them in their own bed and don’t provide sleep props. 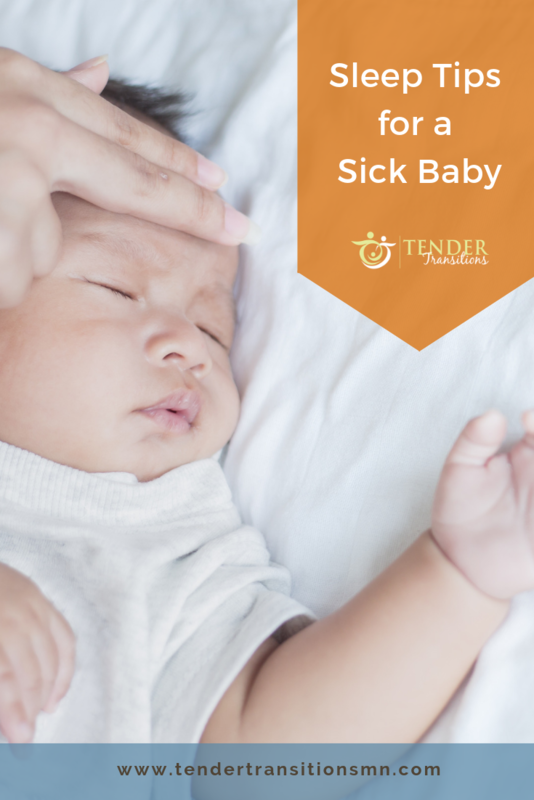 Your child is sick and understandably still needs you. You should absolutely feel free to go in and check on your little one. Give them a little cuddle and take care of any needs that they may have. Just be careful and be sure to put them back into their crib or bed before they fall asleep or get too drowsy. You don’t want to go back to the beginning of the drawing board in your sleep. Your baby should not rely on a rocking session in order to fall asleep. A gentle pat and reassurance are often enough as a source of comfort. After your child is healthy again, there may be a period of adjustment and a slight regression may take place. However, if you have been following your normal routine, your little one just needs a reminder of how things go and then they will easily fall back into a routine. Re-establish your bedtime routine and you will see improvement in their (and your) sleep. If you are new to sleep training and want to know more about how to develop a sleep plan for your family, feel free to schedule a time to chat with us through the link below. Our team of sleep coaches at Tender Transitions would love to help you and your family develop better sleep habits and get the rest your body needs. We want to know what you or your baby/child are struggling with so let’s chat! Schedule your free, no-obligation 20-minute phone call to see if we are a good fit.